Eclectic Paperie: Scor-Pal is Coming to eP! Scor-Pal is Coming to eP! One of the best things about attending CHA is being able to actually meet the owners of companies and their creations. You can really tell how passionate they are about their inventions and designs. It makes their product more personal when you meet its creator/owner. You can also meet the design team members who come up with some fabulous creations. Watching the designers in action as they demo the latest and greatest products is really a treat to see in person. Which now brings me to Scor-Pal® . 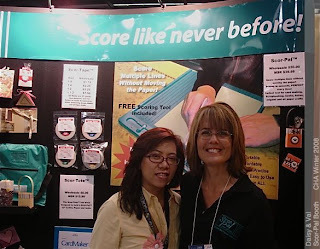 Joy and I met creator Diana Crick and her husband Roy who made their CHA debut with Scor-Pal. They had traveled all the way from Canada to Anaheim, California to show the craft and hobby world this "must-have" tool. Every paper crafter needs one. You've all heard about this great scoring tool. It's so handy to have around for making those perfect folds and score lines. They had one of their designers, Valerie Stangle, with them who was busy throughout the entire show demonstrating the versatility and usefulness of the Scor-Pal. Val has been featured as one of our eclectic Friends so it's always great to see her. eclectic Paperie is happy to announce that Scor-Pal will be joining the eP product mix. We've ordered the Scor-Pal and we'll let you know when they arrive. Stay-tuned for more of my CHA highlights. I still have to share photos and news from Cosmo Cricket, Basic Grey and a new roller by Clearsnap that you can use with your acrylic stamps(hmmmmm). This is so awesome...I've been wanting one to compliment my Scor-it (can one have too many scoring tools??? :)...I think not) I trust that you will all let us know when they arrive! Yay...this is great news! I certainly think it is a "must have tool" as well!